Okay, so I now have a loom. It’s not as easy as just sitting at the loom and starting weaving. Before you do that you have to dress the loom. That’s planning out a project, doing the math to figure out how much yarn you need for the warp and the weft, winding a warp, sleying the reed and threading the heddles. Sounds like a new language, well it is in many ways. Here is my first project. It’s going to be a 10″ x 60″ scarf. The warp is commercial lace weight merino/silk blend. It’s being wound onto a warping board. The warp is 3 yards long. I had to make 160 ends. That’s a lot of wrapping. You keep your threads in order by doing this lovely cross. Lovely indeed. You have to remember to do it each time, below on the way down, up on the way back. Easy rule, but just as easy to forget. You take it off the warping board by making a gentle series of loops, like a crochet. You would not believe the amount of work this wee braid represents! Then you do all this other stuff with the assistance of lease stickes, and start sleying the reed. That means putting the warp threads through the reed, in order. This is an eight point reed and I am putting two threads in each slot. After that I have to thread the heddles. This is going to be a plain weave; up and down. Plain and simple. So the pattern for threading the heddles is one thread in a heddle on shaft 1, next one in a heddle on shaft 2, and so forth. Keeping the order perfect. Well I am not there yet. That’s my next task. Will keep you updated, and next post will show you the hand spun yarn I am using for the weft. This entry was posted in dressing a loom, making a warp, sleying a reed, weaving on January 31, 2014 by DianaTwiss. Here is a new addition to my studio – a handmade 4-harness loom. It’s 32″ wide. I don’t know much about weaving, so I am at a loss for describing it. I decided I wanted to learn how to weave because I want to try to use up all the hand spun I’ve been producing. And, I want to make those lovely soft cotton/linen tea towels that I see at our guild sale. A fellow guild member was selling this loom. We ended up trading this loom (and a bunch of other stuff that goes with it) for the Thumbelina spinning wheel I refurbished. I don’t have the space to be a wheel collector, so I was happy to do a direct trade. Getting this loom has been a good thing. It motivated me to tidy up my studio and to organize things in a much more efficient way. I don’t even know where to start. . . well, yes I do. It involves inviting a certain special guild member over to my house for a cup of tea and a beginner lesson. This entry was posted in 4-harness, loom, weaving on January 30, 2014 by DianaTwiss. Ever get to the end of a knitting project and want to have enough to cast off and at the same time make sure you use all the yarn? I have figured out a way to do this. Prior to this I would do the “three times the length” and add another length for good measure as a way to make sure I had enough yarn to cast off. This doesn’t always work and I have found that out the hard way. 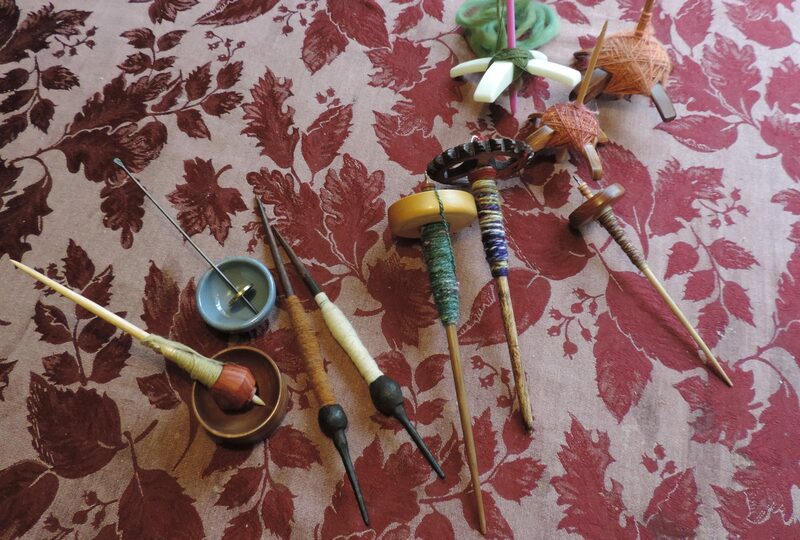 It is also really difficult to do with pieces that are being knit in the round and are all scrunched up. So this is how I’ve solved the problem. I used my scale. I have a very sensitive scale that measures grams into the decimal points. So at the beginning of a row for my 100-Mile Skirt, I weighed the yarn. Knit all around and weighed it again. Got a measure. Did this a few more times and came up with an average. and rounded up. I have 14.7 grams of yarn left. It takes approximately 4 grams per round. So that means I can do 3.675 rounds. That means two more rounds and a cast-off round with confidence. And here’s what’s left as I started the bind-off row. Yes, the bind-off row. Photos later on the FINISHED, blocked skirt. This entry was posted in 100-mile clothing, knitting on January 4, 2014 by DianaTwiss. Who doesn’t love the feeling of a just completed project? Especially when it’s an overdue present for someone. Today while watching the Heritage Classic Hockey Game between Detroit Red Wings and Toronto Maple Leafs I tackled the thumbs. 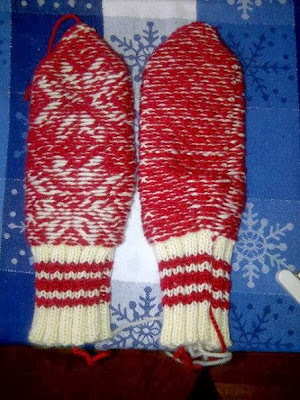 It was tricky picking up the stitches and making sure they lined up with the pattern, so once I did one, I grabbed another set of needles and picked up the stitches on the second mitten. Then I knit the thumbs at the same time. It was a good strategy because once I was done, I was done. I didn’t have to go back and do a second thumb. Here they are before I wove in all the loose ends, washed and blocked them. And here’s what the inside of stranded mittens looks like. Adds a second layer, thus these are warm mittens. Way more mitten than we need here in the lower mainland of BC, but they are such a great traditional pattern, I had to try them. 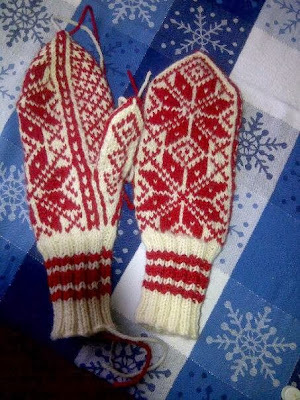 This entry was posted in Norwegian mittens, stranded knitting on January 1, 2014 by DianaTwiss.